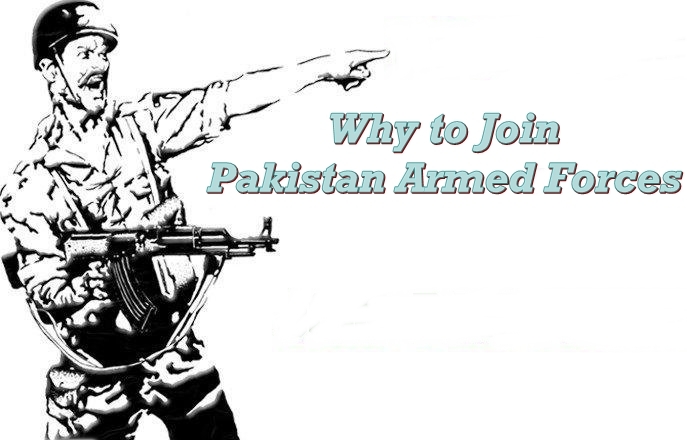 In this article, we will be discussing about the various reason which will give you a very satisfactory answer of the question that why an individual should join Pakistan Army, Navy or PAF as a career. Although there are tons of reasons behind joining the Pakistan armed forces but here we will be shedding light over some of the most important aspects. But before we move towards those points, let’s have a general introduction of Pakistan Army, Navy and Air Force. The Pakistan Army came into existence immediately after the independence of Pakistan in 1947 and since then, it has been protecting the land of Islamic Republic of Pakistan against all internal and external threats. Also established immediately after the independence of Pakistan, Pakistan Navy defends the Sea boundaries of the country with the support of Maritine Security Agency (MSA), Pakistan Marines and Pakistan Coast Guard. The third armed force is Pakistan Air Force (PAF) which is responsible for aerial defence of the country and providing air logistic support to Pakistan Navy and Army. Main ny FSC kia hai ..
Kia mjy test date or procedure k baary main koi guideline mil skti hai?? I have a keen desire to serve myself for Pakistan Army…. My Father was also in Pakistan Army…. pll tel me M 21 years Old N i want join pak Army doing b.a M girl so pl kindly tel me what should i do 2 join tizzz??????? I want to join PAF after ics as a general duty(pilot). Is it possible.??? Sir I am selected for cadet college skardu could you tell me about this college and maybe my future immediately I am selected for intermediate. Can anyone help me, as I have passed my initial test at airforce and Now they have given me the date for interview so please anyone out there who knows about this interview thing help me I’ll be very thankful. i want to join pak army after F.A. You can apply through Pak army website .please keep in touch with Pak army official Website and continuously read a news paper like Jang Express etc. Now a days PMA 140LC is announced to join Pak army and become a commissioned officer in pak army. i want to join PAF after HSC where should i apply and how?